Caterpillar offers the Uninterruptible Power Supply (UPS) 1200 kVA/960kW/60 HZ System with flywheel-based technology, providing the industry's smallest available footprint with superior capacity and performance. The system features a 97 percent total system efficiency that translates into significant cost savings, especially when compared to traditional UPS products. 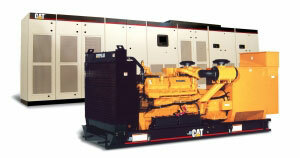 The Cat® UPS 1200 System offers minimal input current distortion, transient protection and harmonic distortion cancellation, enabling seamless integration with Caterpillar generator set systems.